Come join the Ohlone Wind Orchestra as they tell stories of war, romance, tradition, nature, and more – through music. Included are: Shaker Suite by Rayburn Wright (featuring the Ohlone College Brass Quintet and Shaker melodies from Appalachian Spring), the tragic yet romantic Riften Wed by Julie Giroux, the fast-paced Frenergy by John Estacio, the sacred hymns of Sacred Harp by Jay Bocook, the grandiose Marche Slave by Peter Tchaikovsky, the graceful and gritty Pageant by Vincent Persichetti, and more. Tickets $15/$10 at the door or www.SmithCenter.com. Parking is $4. 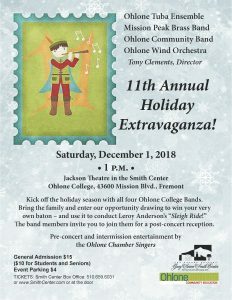 For more information, visit www.OhloneWindOrchestra.org. 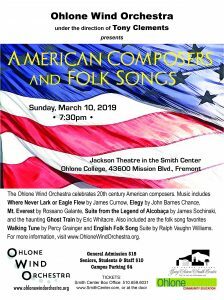 Come out for an evening of delightful music as the Ohlone Wind Orchestra celebrates 20th century American composers. Music will include Where Never Lark or Eagle Flew by James Curnow, Elegy by John Barnes Chance, Mt. Everest by Rossano Galante, Suite from the Legend of Alcobaca by James Sochinski, and the haunting Ghost Train by Eric Whitacre. Also included will be the folk song favorites Walking Tune by Percy Grainger and English Folk Song Suite by Ralph Vaughn Williams. 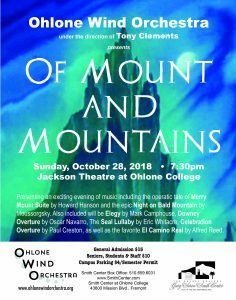 Join us for exciting evening of music including the operatic tale of “Merry Mount Suite” by Howard Hanson and the epic “Night on Bald Mountain” by Moussorgsky. The program also includes “Elegy” by Mark Camphouse, “Downey Overture” by Oscar Navarro, “The Seal Lullaby” by Eric Whitacre, “Celebration Overture” by Paul Creston, and the favorite “El Camino Real” by Alfred Reed. Kick off the holidays with a festive concert by the Ohlone Tuba Ensemble, Mission Peak Brass Band, Ohlone Community Band, and Ohlone Wind Orchestra. 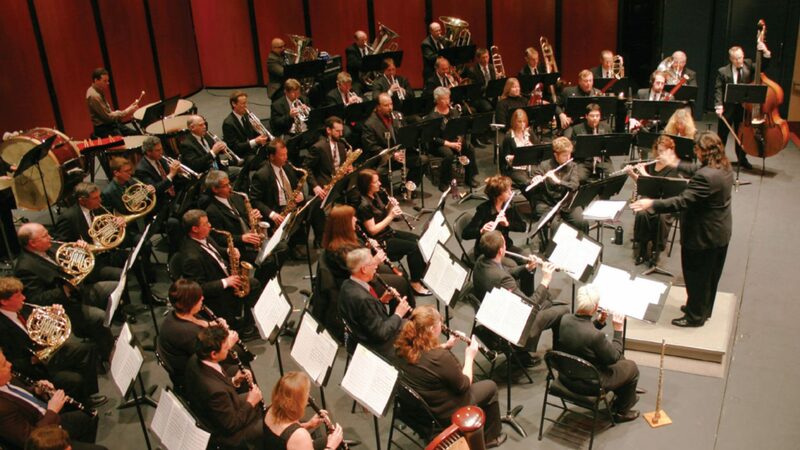 Bring the family and join our raffle for a chance to win your very own baton – and use it to conduct Leroy Anderson’s “Sleigh Ride!” Band members invite you to a post-concert reception with holiday goodies. Pre-concert and intermission entertainment by the Ohlone Chamber Singers. Live recordings of our concerts are available through Johnson Digital Audio.